Apparently, the hope is that these would be more popular than Sacagawea dollars or Suzie B's. So, would slipping a "Bill" in a stripper's "coin slot" be ironic? Before long, American pockets could be jingling with dollar coins engraved with the faces of Ronald Reagan, Millard Fillmore and Bill Clinton, as Congress considers a plan to begin minting dollar coins to commemorate all the past presidents. Hoping to cash in on the popularity of the state quarter program - which has generated $5 billion in revenue and turned an estimated 140 million Americans into coin collectors - the House of Representatives began debate Tuesday on legislation that could turn the dollar coin into a collectable. The current dollar coin, which made its debut in 1998, features Sacagawea, the young Shoshone interpreter who guided the Lewis and Clark expedition. It has yet to come into widespread use. "That coin needs some sort of boost to do better," said Rep. Michael Castle (news, bio, voting record), R-Del., who sponsored both the state quarter and the presidential dollar legislation. "The question is, will there be enough demand (for the new series) for a young person to walk into McDonald's and tell the cashier, 'I want a $1 coin in change.' "
Because coins are more durable than bills, the government could save as much as $500 million a year on printing costs if the public embraced the dollar coin, according to a 2002 report by the Government Accountability Office. The government minted just 6.7 million Sacagawea dollars last year, most of them destined for private coin collections. In addition to the state quarters, the mint is rolling out a series of commemorative nickel designs celebrating the Lewis and Clark expedition. "We've really seen a coin renaissance in the past few years," said Henrietta Holsman Fore, director of the U.S. Mint. "Coins tell the story of our nation. They help us reconnect with our history." Is that an "alternate" quarter design? I say bring it on... I love cool coins. Get rid of the penny while you're at it, though. how long have you been saving that? 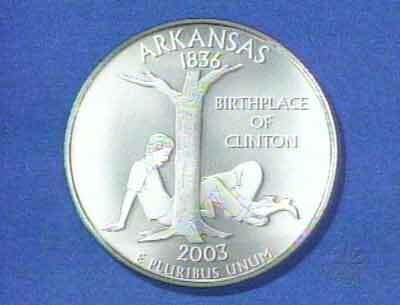 As long as there's a Chester A. Arthur coin, I'm all for it. Actually when I saw the thread title, I remembered seeing that years ago. A quick google, and there you have it. when are they going to realize the reason people don't use dollar coins has nothing to do with who's picture is on it? We've "always" had dollar coins. People just hate them. I'm sure Susan B. Anthony would be proud that a coin with her image on it gets thrown at strippers. Will there be two Grover Cleveland coins? And will the Lincoln, Garfield, McKinley, and Kennedy coins have holes in them? Will the William Henry Harrison coin expire after 30 days? Yes and Reagan's will have a nick on the edge. The Nixon dollar coin will only be worth 75 cents. Exactly. For this ever to work they would have to stop printing $1 bills. They need to just commit to it and don't look back if it is ever going to fly. Actually, I'd be more liable to use these than any others. I don't want some coin with ugly Sacajawacka on it, or Susan B. Anthony (who?). So these coins are for people who think "Sacajaweea and Susan B. Anthony are fugly, but Millard Fillmore gives me wood?" The FDR dollar will only be worth 50 cents because of the taxes taken out of it. I think it is a great idea, but they need to stop making $1 bills so that people will actually use these instead of hoarding them. Why exactly would a libertarian think the mint should stop making dollar bills? *The Mint offers both dollar bills and dollar coins. People can choose which to use. Isn't individual choice good? If people wanted more coins (MUAHAHAHAHA), the Mint would mint them. *Many people cite vending machines, but through American ingenuity, we have vending machines that can take bills, and even offer bills as change. *Dollar bills are much lighter ( 1 g vs 8 g), slightly less bulky, and certainly less damaging to one's pants pocket. I hate the coins, but I don't really care if both are available. Has nothing to do with freedom of choice. It is because I believe it is cheaper in the long run to go with a coin dollar exclusively. Coins are more expensive to produce but they last far longer. More damaging to pants pockets? Coins aren't razor blades you know. When is the government going to stop trying to make us use dollar coins, it's obvious by now the people don't want to. I actually had no opinion of it one way or the other until a recent first trip to Canada... now I really dislike dollar (and two dollar) coins. The couple times I had to get stamps out of the machines at the post office, and got back those coins, I've always had people stare at them and me for a few seconds whenever I'd try and spend them..